The Big Joe S22 Power Drive Stacker can just about handle any pallet or skid that comes its way. 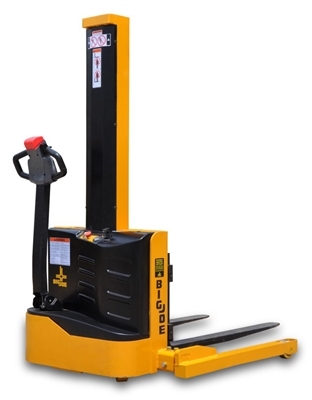 The S22 is a powered drive and lift stacker with adjustable forks, legs and straddles, making it the perfect unit for narrow or confined aisles because of its 62", 98" or 116” lift height and tight 52½” turning radius. This narrow aisle stacker is a step up from a manual push stacker and can load up to 2,200 lbs. The S22 power drive straddle stacker travels at 2.5 mph loaded and 3.4 while unloaded. In addition to top-notch performance, it’s completely constructed from steel, contains a welded, rigid steel chassis for real durability, and features a highly efficient permanent magnet drive motor. Get your S22 at West Coast Shelving! Max. Lift Height: 62" / 98" / 116"
Collapsed Height: 76.5" / 70.75" / 80.75"